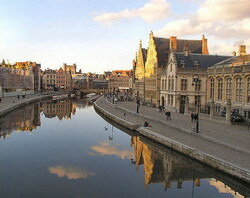 Ghent is a city and a municipality located in Flanders, Belgium. It is the capital and biggest city of the East Flanders Province. The city started as a settlement at the confluence of the Rivers Scheldt and Lys and became in the Middle Ages one of the largest and richest cities of northern Europe. Today it is a busy city with a port and a University. The city is connected to the sea by the Ghent-Terneuzen Canal, it lies at the intersection of the European highways E17 and E40 and it has the third busiest railway station in Belgium. Sint-Jorishof / Cour St Georges Hotel is situated in the centre of the historical town of Ghent, opposite to the Town Hall and the famous St. Jorishof. This charming hotel offers all the comfort of the current day, in a building that dates back to the 18th century. Guests may choose between two types of rooms, the Tradition and the very cosily decorated, Privilege rooms, offering that little extra that will make your stay even more enjoyable. In the morning, a delicious breakfast buffet can be relished at the splendid 18th century breakfast room. A business centre at the hotel's lobby is also available for your business needs. For guests who prefer to come by their own vehicle can avail off the favourable parking space, provided on site. 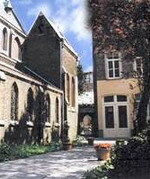 Located in the centre of medieval Ghent, Monasterium Poortackere is a serene hotel housed in a former nunnery. 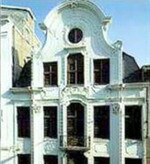 Built in a neo-gothic style the property dates back to 1278. Guests can explore the former monastery and absorb its tranquil atmosphere, or relax with a coffee and newspaper in the enclosed garden. The chapter house is also open for evening meals on Fridays and Saturdays when guests can enjoy a menu of typical Belgian dishes beneath the beautiful neo-gothic arches. Ghent's attractions are within easy walking distance from the hotel, including Pont St Michel, a bridge which offers stunning views of the old town (300 metres). The medieval houses of the Quai Aux Herbes is 350 metres away, and the restored medieval castle, Château Des Comtes De Flandre, is 600 metres.